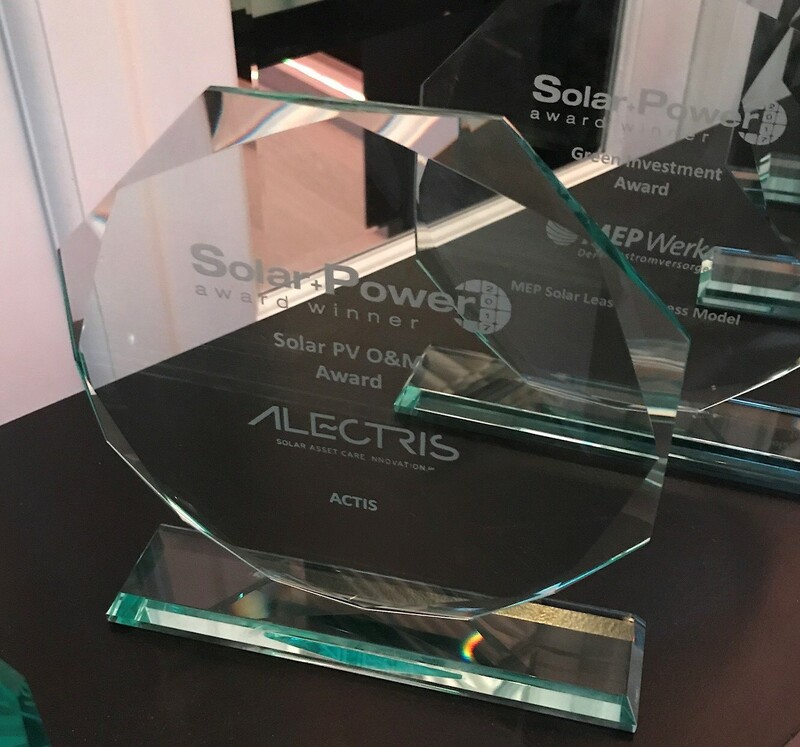 3 October 2017: Alectris, a global solar asset care innovation firm, has received the prestigious, peer voted, Solar + Power Solar PV O&M 2017 Award for its ACTIS, Solar ERP (Enterprise Resource Planning) platform. The Solar + Power awards were presented on September 26, 2017 in Amsterdam, The Netherlands, in conjunction with the 33rd European Photovoltaic Solar Energy Conference and Exhibition (EU PVSEC), the largest international conference for photovoltaic research, technologies and applications. PV Magazine reported 4,800 industry professionals cast a total of 30,000 votes to award the winners across various categories representing the solar value chain: from materials to end products, from process innovations to outstanding individuals working in the industry. 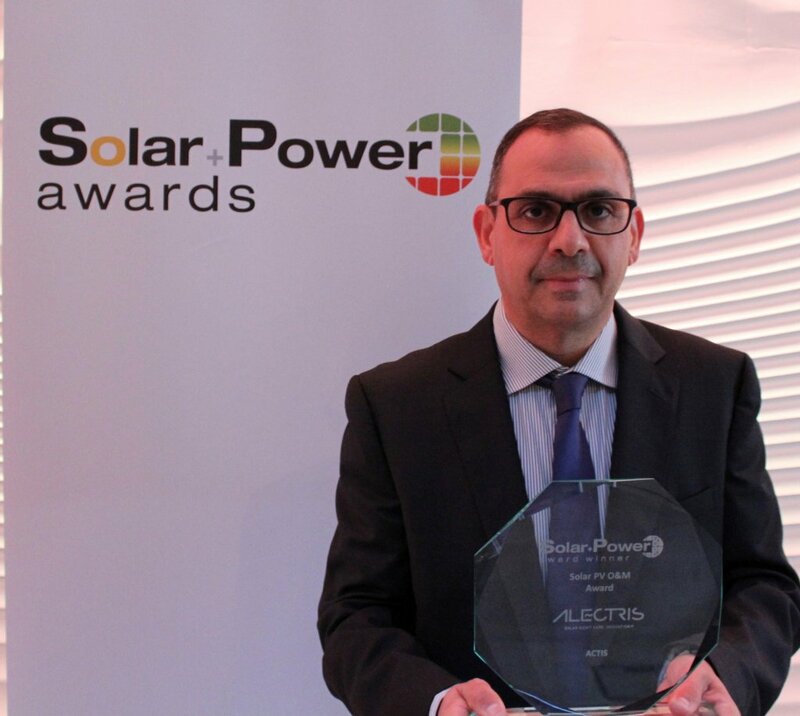 Constantinos Peonides, Director for Alectris receives the Solar + Power Solar PV O&M Award on behalf of the company for its ACTIS, Solar ERP platform. In a world of rapid consolidation, ACTIS is a unique tool to efficiently manage solar PV assets, streamline operations, decrease costs and increase performance in the most cost-effective solution. This is the third award for ACTIS. In 2015, the integrated solar asset management software tool from Alectris won a Silver Facilities Management Award. This followed a Bronze in the same competition in 2014. The company’s internal analysis has revealed tens of specific tasks for each individual plant managed either directly from the Asset Owner or in conjunction with Service Providers. The size of the solar PV portfolio increases the number of tasks to levels not sustainable in a cost-effective way, which increases management overhead and the risk of missing important regulatory or technical issues. Even the most advanced organizations are using multiple systems (10 on average) to conduct their operations, maintenance and asset management activities. In this framework the need for a uniform, centralized system integrating all operational activities into one single database has become a necessity. Along with the cost and regulatory challenges comes the need for standardization across multiple teams located in different regions and countries. The time needed to gather information and create consolidated reports with validated data has increased to the point that in many cases teams spend the biggest part of their work to gather and report information instead of conducting actual management activities. This is exactly the need ACTIS addresses, developed out of real life experience with engineers who are provide such services. ACTIS unifies all information and data into one single database, eliminating the challenge and risk of integrating separate and isolated systems. Alectris delivers asset care innovation for the global solar industry. With our integrated suite of operations, maintenance and asset management services, award-winning software and retrofit technologies, we empower owners with full control of their portfolios to realize worry-free, high performing solar assets. Connect with us on LinkedIn and Twitter or visit us at www.alectris.com.